Alex works on Shera's hair. Anyone out there, like me, wanting their hair to look and feel amazing: This is your lucky read. 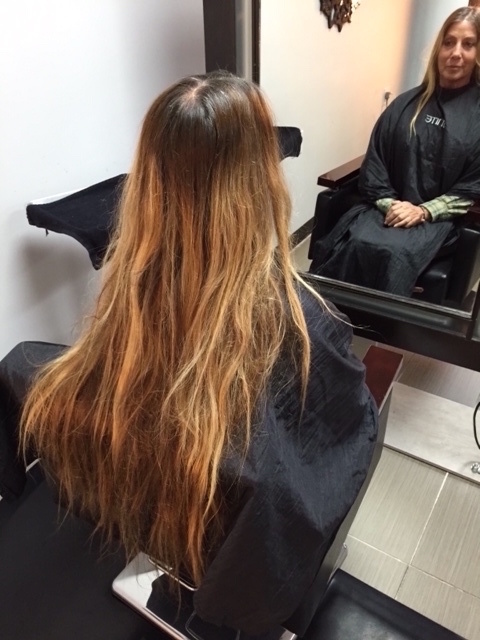 The Hair Lounge at Escondido Promenade has arrived to make your dreams come true. 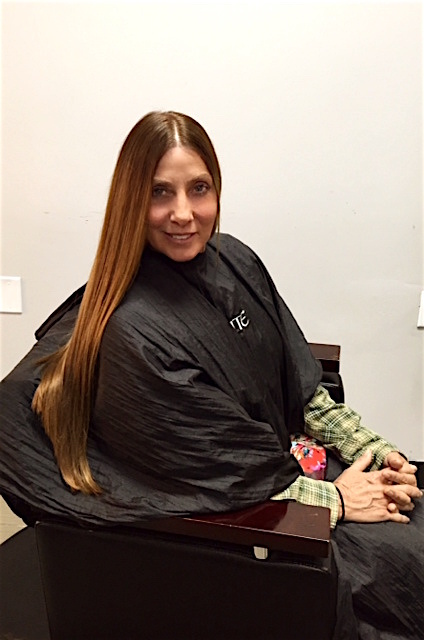 I have lived in North County San Diego for 35-plus years and have patronized beauty salons seeking the color and cut that suits me best. Just when I thought I found my stylist, she moved out of state. I was reluctant to try another salon because I would end up with the wrong color and cut and my hair looked more damaged as time passed. I found myself needing more, and more, appointments to keep up with the needs of my hair. Fortunately, during the holiday season, I was shopping at The Promenade and walked into The Hair Lounge. It was one of those magical experiences where the energy and the vibe speaks to your consciousness and tells you this is the one. Full of anticipation and my hair in desperate need of coloe, conditioning, and cut, I made my appointment for the next week. My appointment time was 1 p,m. I was greeted right away by Alex, my stylist ,and taken to her modern, yet relaxed, station, then cloaked. She was pleasant and I relaxed into the chair as she brushed the tangles out. Alex really took the time to discover who I am and what would give me a result that would not only look great but fit my lifestyle. Alex matched my natural color and accentuated my highlights and lowlights. The products she used transformed my dry damaged locks to silky and lustrous. To top it off, she cut my hair leaving the length with elegant style. I’m so happy that I finally have the hair I always wanted. It has been several weeks since and I am still getting compliments on how beautiful my hair is and it’s so easy to take care of. The Hair Lounge is extraordinary in service, product, style and cares about your hair. Be the first to comment on "Happy to have the hair I always wanted"